"The women in our family can be as sweet and mild as milk through all kinds of adversity. But everyone has their breaking point..."
There�s this guy, see, who marries a sweet innocent girl who is years his junior. He is kind of a bucktoothed, stringy looking fellow with less chin than he might have and she is as fresh and beautiful as a rosebud in May. 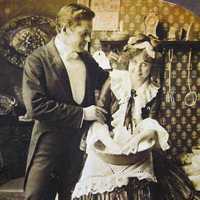 We don�t know why her parents agreed to this marriage, but we might guess that for whatever reason the girl was set on him, the way that young girls do get set on things sometimes. So they marry and he pays her some attention for a year or two and they seem happy. Next thing you know, she is left rattling around on her own at home while he�s off carrying on with a former lover. Former Lover is (in addition to being much older and much less attractive than the bride) also married. This does not seem to faze her a bit. Nor does it appear to faze her husband. Or the groom. Or the groom�s family. Nobody seems to think it is much of anything to worry about except the bride. The young bride is criticized by her in-laws for wishing her husband would pay better attention to his wedding vows. She is told that she is spoiled and self-centered. Now, I should tell you women of the American West that this bride is not a pioneer daughter. You might have guessed this by the fact that the bride moped and shopped rather than offering her errant groom a choice between paying her the respect and attention she deserved or acquiring a seatful of buckshot upon which to ponder. No friends, I am not rehashing some awful episode of daytime television yuckiness. This is the British Royal family I am talking about. Royalty. Folks who are supposedly brought up to know just how to behave properly in any situation. In fact, this seems to be one of their main functions in these modern days when they no longer crusade or protect the commoners from marauding dragons, behaving properly. Yet Prince Charles conducted himself in a way which might make even Jerry Springer wince. As my husband says, "Folks is folks," and I guess it proves that growing up with privilege and education doesn�t guarantee anything. My grandpa told a story about one of his aunts and her husband. It was breakfast time. The wife had just finished churning and had the fresh butter in a great big bowl. The husband was at the table eating when a visitor came. The visitor was invited in and sat down at the table. The wife brought him a plate and he began to have some breakfast with the husband. The husband noticed that there was no butter on the table. "Woman!" he hollered, "bring us some butter!" He must have known this was a bad idea. I don�t know how long they had been married, but if it was longer than fifteen minutes he must surely have known this was a foolish, foolish display of reckless disregard for his own safety. You will probably have guessed that she brought him the butter. A whole great big fresh bowl of butter. "Here�s your butter, " she said, and tumped the whole bowl right on his head and left him there wearing a big pottery helmet. He pulled the bowl off his head and threw it onto the table (not, you will note, taking a chance on breaking it by throwing it on the floor. He wasn�t a complete fool. ), shook the butter out of his eyes and headed for the door. He slammed out, leaving his dignity melting on the floor with the blobs of fresh butter and stomped off behind the house. The women in our family can be as sweet and mild as milk through all kinds of adversity. But everyone has their breaking point, and that imperious demand for butter must have been this woman�s. Who knows what else had been going on. She had made a point with the butter, but felt a need to punctuate it. This she did from the back stoop by shooting her husband�s backside with a light sprinkling of birdshot, giving him six or seven emphatic little lead points to consider in the future. I love to tell this story about their not too distant relatives to my children. I think it gives us all something to think about. Gives the girls something to think about and gives the boys something to think about. Too bad Prince Charles never enjoyed a meal with us and too bad Princess Di wasn�t a McAnally girl.